I spent the entire July Fourth holiday last year making a roast. Not one you’d ever want to eat—it was made of old tights wrapped around a bag of tiny Styrofoam balls. My kids helped me paint the roast and wrap it in twine so it would look authentically trussed. Then we situated it on a platter with fake apples and leaves pulled off a garland of artificial ivy. 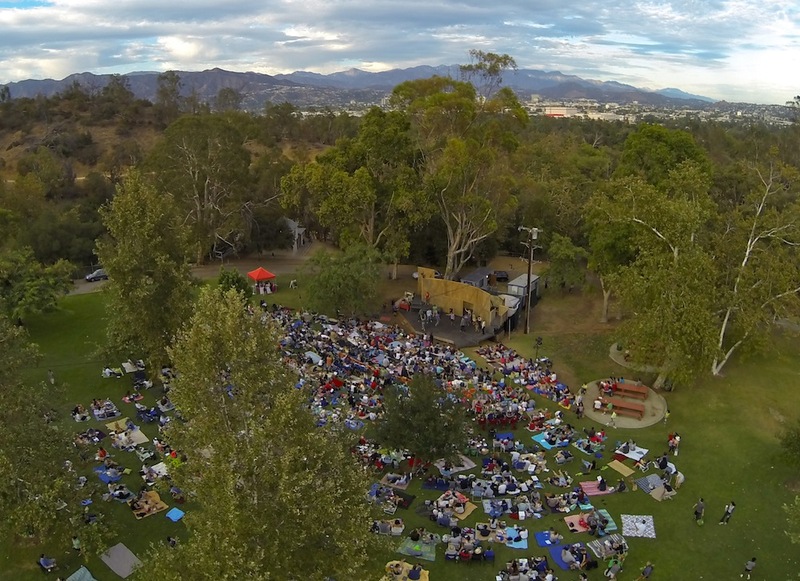 The Griffith Park Free Shakespeare Festival has been an unexpected success. Looking back, our Independent Shakespeare Co. ended up exactly where it was meant to be—offering a particularly Los Angeles version of the venerable summer tradition of outdoor Shakespeare—but the process involved more happy accidents than calculation. When we started, we were so grateful to anyone who turned up that we’d try to thank every member of the audience personally. We still try to meet as many people as we can, and to preserve the festival’s freedom and exuberance. But last summer, more than 43,000 people came to our free performances. Just as astonishing for us to contemplate is that the city of Los Angeles is planning to build a permanent stage at our performance site in Griffith Park. Five years, one pregnancy, and a move across the country later, we were still producing plays. We never considered doing anything but small productions that would be attended by, shall we say, a select few. But in 2003, our first summer in L.A., a friend suggested we look at an amphitheater in Franklin Canyon Park in Beverly Hills. We staged a weekend of free outdoor performances, which led to a city of L.A.-sponsored residency in Barnsdall Park in East Hollywood the following year. Only 14 people showed up for opening night of The Two Gentlemen of Verona, but the audience steadily grew over the course of the summer. That season was 12 performances long, and just under 1,000 people attended. We were perpetually broke, so we ended each night by asking for money (we still do). One afternoon that first summer, a mother with two children in tow approached David to ask what we were up to. She and her kids returned that evening for the free performance. On their way out, she took David’s hand and thanked him: They didn’t have much money and often came to Barnsdall because the park was a free place to spend time. Then her son—who must have been about 9—reached into his pocket and gave a handful of change to David. Looking back, that was the moment we were all in. Back then, we took reservations. It started out as our way of staving off anxiety about throwing a party that nobody would come to. But people did come—and not just our friends or members of the theater community. Angelenos who were already in the park came because they were curious. Or they saw a sign or read in the paper about the free performances. The Independent Shakespeare Co. office was our garage, and the reservation line rang in our house. Within a few years, we were using the reservation list to turn people away, which precipitated our move in 2010 to the Old Zoo in the northeastern corner of Griffith Park. You can still see the old animal cages and, walking up the hill to the site, you really do feel you are getting away from the city. It is a magical spot, one we are grateful to inhabit for 10 weeks each summer with support from L.A.’s Department of Recreation and Parks. We’ve been so lucky with our company of artists—people who are passionate about theater and even more passionate about Los Angeles. All of us at Independent Shakespeare Co. are crazy in love with our city and its boisterous, fluid, upbeat populace. And we love the wild unpredictability of our audiences. Once, during intermission for Othello, a group of young people began chanting, “Othello, don’t believe Iago!” We like to run through the audience, pull people up on stage, and bring them into the action. Lots of young people come to the festival, many of whom are seeing a play for the first time. There are also families who have been coming for years and are now sending their children off to college—children we’ve seen grow up from summer to summer. Still, I can’t always account for what I see and hear at the Griffith Park Free Shakespeare Festival. I once saw a woman get up in the middle of a scene to have a loud cell phone conversation in which she related in detail how great she thought the performance was. More than once, I’ve seen a couple who were clearly more interested in each other than in the performance (and covered with more blankets than are strictly needed in August in Los Angeles). The environment is chaotic and not-quite-contained: There are bees, muddy patches, bathroom lines, and—almost every night—the sound of coyotes, sometimes disconcertingly close. I’ll confess that Independent Shakespeare Co. (like our audience) can be a bit rag-tag. We certainly tend toward the populist end of the art spectrum. I suspect that, like most of us onstage, people in the audience are a bit less well-heeled than a typical theater-goer. They look pretty much like a crowd at Dodger Stadium. And I think (in my more self-aggrandizing moments) that Shakespeare would be pleased to look out on a summer night at the Griffith Park crowd. There was, after all, a reason he called his theater “the Globe.” He envisioned a place that would encompass and embrace everyone. We’re doing our best to follow his legacy. And to make good on a little boy’s pocket change. Melissa Chalsma is artistic director of Independent Shakespeare Co. She is an actress, director, and teacher. She and her family live in Eagle Rock with two rabbits, five fish, and a cat. This summer’s Griffith Park Free Shakespeare Festival is being held June 26 to August 31 and features Twelfth Night and The Taming of the Shrew, with special events and performances throughout the summer. Visit iscla.org for more information. *Lead photo by Colin Burgess. Interior photo by Mike Ditz.